are a bright yellow, and its legs are a dusky green. The black-capped donacobius also has a yellow cheek pouch that can puff out. Geographic range: The black-capped donacobius can be found from Panama to coastal Brazil and into northern Argentina. Habitat: The black-capped donacobius can be found in the brushy vegetation over slow-moving rivers and ponds, at sea level and rarely up to 2,000 feet (750 meters), usually lower. Diet: The black-capped donacobius's diet and feeding habits are unknown. Behavior and reproduction: The black-capped donacobius is noisy and expressive, with pairs taking part in loud, ritualized displays, and spreading their wings. Their song is a series of loud whistles. The female's song is lower and has a more grating quality than the male, and the birds often join in a chorus. The black-capped donacobius breeds cooperatively, meaning that the nesting pair usually gets help raising their new hatchlings. This comes from up to two additional birds—usually their own young from the previous year or two. When a pair has no assistants, they raise only one bird. Help increases the brood to two. The nest is an open cup and is most often built near or over the water. Eggs are a purplish white covered with reddish or purplish spots and blotches. 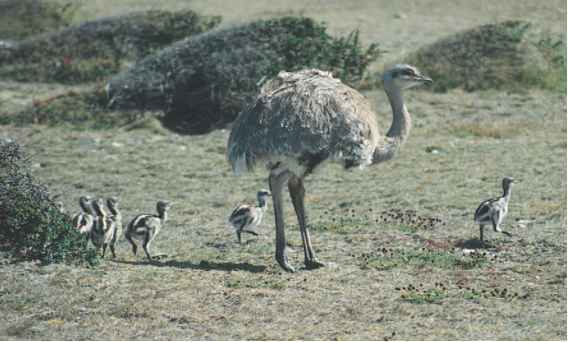 The female alone incubates the eggs for sixteen to eighteen days, with both sexes and the helpers feeding the young. The birds gain their flight feathers at seventeen to eighteen days. Adult birds keep their young cool by wetting their body feathers in water. The black-capped donacobius only has one brood each breeding season. Black-capped donacobius and people: The black-capped donaco-bius has no significant connection to humans. "Everything About Wrens." About Birds. http://birding.about.com/od/ birdswrens/ (accessed on June 16, 2004). "Wrens." BirdWeb. http://www.birdweb.org/birdweb/family_EZ.asp? 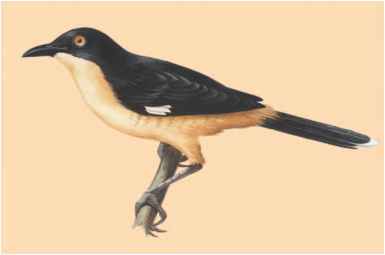 famname=Troglodytidae (accessed on June 16, 2004).